Born in 1922 Denis Rose became a legendary character among local jazzmen. Strictly self taught, by 1942 he was a 'bottle party' band leader of no mean repute. He led bands at the Panama (Knightsbridge) and the Jamboree. His career was interrupted when he was called for Army service in 1943 during the second world war. This was an unhappy time and he deserted and spent several years on the run from the Military Police hiding out at a friend's house during the day. 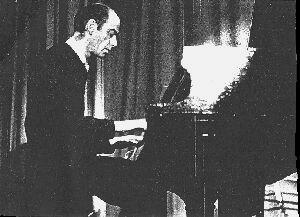 In 1945 he joined Johnny Claes' Claepigeons, where he probably first met Ronnie Scott. Following his time with Claes' nine piece band he worked mainly with palais dance bands before joining Tito Burns' big band and sextet where he played trumpet, piano and occasional drums. When the first bebop records arrived in 1947 Rose made it his task to unravel the new harmonic concepts. He became the theorist of the British modern jazz movement, with many young players turning to him for advice. As a trumpeter he lacked technique, (but claimed he never practiced), and would explain his points on the piano. At one time he spent all day and every day listening to the new jazz in record shops. At this time the musicians were still earning their keep in commercial bands although for a time he led a star studded sextet at the Metropolitan Bopera House with himself on trumpet with Ronnie Scott, Johnny Dankworth, Tommy Pollard, Lennie Bush and Tony Crombie. When Tito Burns disbanded his big band almost every important young British bop musician found himself out of work and with nowhere to play. For a while in 1949 he was with Leon Roy's Gillespie inspired big band. Eventually to get somewhere to practice and play bebop the musicians hired a rehearsal room when they had money and this overwhelming desire to play bebop led to the formation of the now legendary Club Eleven when they hit on the idea of charging those who wanted to listen for admission. When Club XI folded in 1950 after a drugs bust Rose was arrested for Army desertion. After Club Eleven he worked with Cab Kaye in the early 1950s and also as a solo piano or with a trio, sometimes playing trumpet with various bands including Norman Burns in 1955. Thereafter he worked mainly as a pianist in North London clubs or pubs rarely playing the trumpet and in 1970 played a residency at the Maestro Club in London. He had little desire to return to the mainstream jazz world and was content to play in pubs and clubs solo or with a trio. Dennis Rose played a major part in the formation of Club Eleven in the late 1940s. He gave a lot of encouragement to the younger musicians and although not much known now was regarded as one of the 'founding fathers' of British modern jazz. He died in 1984 and was recorded only twice. 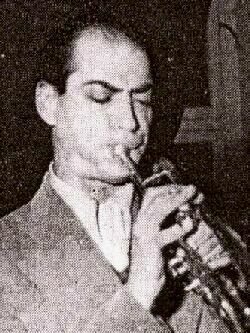 In 1951, with the closing of Club Eleven, Rose severed his connections with the active jazz world,leaving behind him a Thelonius Monk-like reputation compounded of an erratic personality and technique, and influential and far-sighted musicianship. Since then he has worked as a commercial pianist, and although many well known names have played with him he has not appeared before a jazz audience during the past decade. However his creative instincts have not atrophied. In addition to his work on trumpet and piano he now plays alto horn, double bass and tenor sax, and continues to arrange. All these accomplishments have been deployed at private jam sessions, and on one-man-made tapes which he has made for his own satisfaction. On piano, which is now his main instrument, he alternates between swinging and inventive playing in the idiom of Al Haig and Bud Powell, and a uniquely angular linear style of harmonic exploration, but despite the admiration of his colleagues, he will only extend himself musically if he feels inclined. Both technically and physically he is in far better shape than during his years of prominence, and it has been his reluctance to face the stress and uncertainty of the jazz world that have kept him obstinately away from the public eye. He has now agreed to participate as pianist and arranger in the concert entitled New Jazz/New Poetry to be held at St. Pancras Town Hall in November with the new group of young modernists for whom he paved the way, and a handful of fellow innovators from Club Eleven. It is to be hoped that his appearance there will will give Denis Rose and his audience a better understanding and appreciation of one another, for in addition to the recognition he deserves for his past achievements he still has a variety of gifts to offer both musicians and listeners. Reserved and unpredictable though he is, professing distate for the life of a creative jazz artist, if Rose decides to participate once more in the active jazz world, his talent will be of benefit to everyone who cares about modern jazz in this country. Johnny Claes (tp,ldr), Denis Rose (tp), Ronnie Chandler (as), Ronnie Scott (ts), Gerry Alvarez (as,bs), poss. Jimmy Henney (p), Roy Dexter (b), Freddie Crump (d) + George Formby. (This was the recording debut of Denis Rose and Ronnie Scott). collective personnel:Ronnie Scott (ts), Johnny Dankworth (as), Reg Arnold (tp), Denis Rose (p,tp), Jimmy Skidmore (ts), Bernie Fenton (p), Joe Muddel (b), Jack Fallon (b), Carlo Krahmer (d), Cab Kaye (vcl). Ronnie Scott (ts), Johnny Rogers (as), Denis Rose (tp), Tommy Pollard (p), Lennie Bush (b), Tony Crombie (d), Ginger Johnson (bongoes).